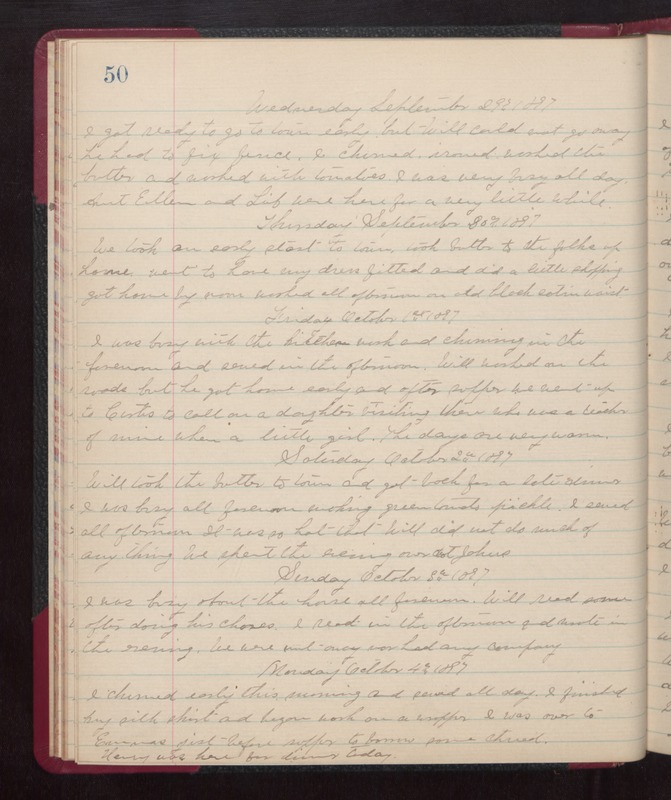 Wednesday September 29th 1897 I got ready to go to town early but Will could not go away. he had to fix fence. I churned, ironed, worked the butter and worked with tomatoes. I was very busy all day. Aunt Ellen and Lib were here for a very little while. Thursday September 30th 1897 We took an early start to town took butter to the folks up home went to have my dress fitted and did a little shopping got home by noon worked all afternoon on old black satin waist. Friday October 1st 1897 I was busy with the kitchen work and churning in the forenoon and sewed in the afternoon. Will worked on the roads but he got home early and after supper we went up to Curtis to call on a daughter visiting there she was a teacher on mine when a little girl. The days are very warm. Saturday October 2nd 1897 Will took the butter to town and got back for a late dinner. I was busy all forenoon working green tomato pickle. I sewed all afternoon. It was so hot that Will did not do much of anything. We spent the evening over at Johns. Sunday October 3rd 1897 I was busy about the house all forenoon. Will read some after doing his chores. I read in the afternoon and wrote in the evening. We were not away nor had any company. Monday October 4th 1897 I churned early this morning and sewed all day. I finished my silk skirt and began work on a wrapper. I was over to Emmas jist before supper to borrow some thread. Henry was here for dinner today.